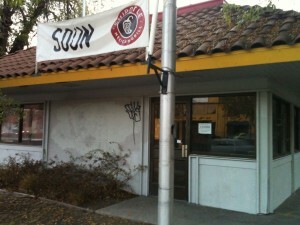 Chipotle is moving into the abandoned Burger King building at 369 South Winchester Boulevard between Fuel and Khanh’s Garden, across from Santana Row. The Burger King previously at this location has been closed for 10 years or more. Chipotle is a fast-food Mexican Grill, serving standard fare such as burritos, tacos, and chips and salsa. The banner appeared recently on the building. There is no information about how soon the new restaurant will open. Permits filed with the City of San Jose in November show a plan to demolish the existing fast-food restaurant and the construction of a new 2377 square foot fast food restaurant on a 0.64 gross acre site. A permit filed in 2007 showed plans of a Starbucks opening at that location. This entry was posted on Monday, December 7th, 2009 at 11:21 pm by John Vink	and is filed under Uncategorized. You can follow any responses to this entry through the RSS 2.0 feed. You can leave a response, or trackback from your own site.